The Memphis airport authority is combining a number of functions into a new, $41 million building. At its meeting Thursday, May 17, the Memphis-Shelby County Airport Authority (MSCAA) Board of Commissioners approved a $41.4 million construction contract with Chris Woods Construction Co. Inc. The Bartlett-based general contractor was the lowest responsive bidder on the new Airfield Maintenance & Operations Support Facility, which will merge several departments into one building. Originally, the MSCAA planned to just house airfield maintenance in the building but decided to add operations in an effort to better coordinate snow and emergency events. 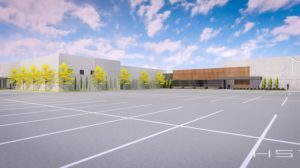 The facility will bring police, communications dispatch, warehouse and operations officers closer to the airfield, since the new facility is being constructed on the site of the former Gate Gourmet building at 4150 Louis Carruthers Dr. The cost of construction has gone up from the $35 million figure reported in December. “We may not have added enough contingency to account for outside factors such as tariffs driving up the cost of steel,” said Scott Brockman, MSCAA president and CEO. The contract also includes a 7 percent, or $2.9 million, contingency, which will require approval by Brockman and the board. The building was designed by HST, a joint venture between Midtown-based Horrell Group Architects and local, minority-owned firm Self Tucker Architects. Engineers on the project include the Pickering Firm Inc., Jamnu H. Tahiliani and Associates, DePouw Engineering, BCM – Barham/Cain/Mynatt and the Faith Group LLC.